Once, during a family dinner outing in Nantucket, my sisters and I came across a food we had never heard of before. When we posed the question to our omniscient parents (because they always know the answer to everything), our dad’s response was “It’s a grain!” And that was that. Grains are tricky. There are cereal grains, pseudocereal grains, grain legumes, grain pulses, and oilseeds. Who knew. Grains also have super trendy names. Quinoa, wheatberries, sorghum, teff, millet, fonio, amaranth, maize, triticale. I don’t know about you, but I have no idea what half of those things are let alone how in the world to pronounce them. Take quinoa, for example. Technically, quinoa (KEEN-WA) is a complete protein and is more closely related to spinach and beets than it is to cereal grains. Dry, the seeds look like itty bitty couscous. When cooked, they sort of flatten out and become translucent and fluffy. Quinoa is high in dietary fiber, magnesium, and iron. Score. Quinoa has been called “the gold of the Incas” for sustaining warriors in battle. Eat quinoa, have the stamina of Incan soldiers. Advantage, consumer of quinoa. Quinoa can be eaten plain, but that doesn’t mean you’re going to want to eat bowl after bowl of the stuff — it leaves a lot to be desired. Luckily, this also means that quinoa is incredibly versatile and can be sassed up in a variety of ways. Serve it in lieu of potato salad at a barbeque. Throw a few spoonfuls on top of a salad. Eat it for breakfast. 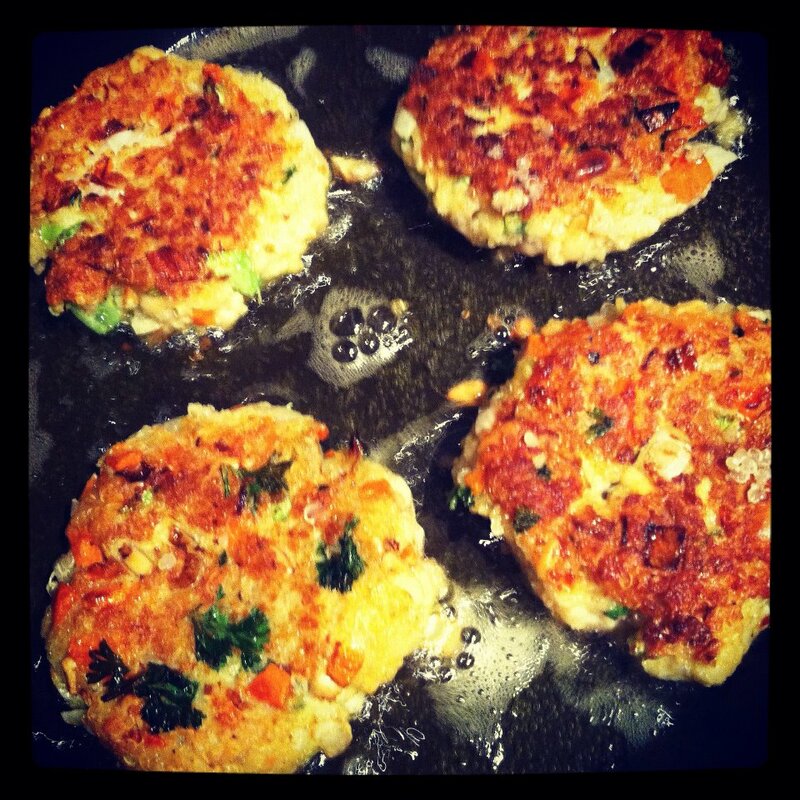 Or, my new personal favorite, make quinoa burgers! Quinoa burgers (or cakes or patties or whatever you want to call them) are an easy, healthy alternative to regular burgers. And you can basically put whatever you want in them. In my cooking endeavors, I tend to stick to ingredients that I know and love. Joy’s recipe calls for olives — I like olives, but didn’t want to put them in these cakes. Heidi’s recipe calls for dill — dill and I are not friends. Linda’s recipe calls for cottage cheese — I didn’t think it was necessary. I used a combination of three and was extremely pleased with the outcome — the recipe is below. Play with your favorite flavor combinations and see what you can come up with! In a medium saucepan, bring 4 cups of water and pinch of salt to a boil. Add quinoa and stir. Turn heat to medium and cover. Cook quinoa for approximately 15 minutes, or until most of the water has evaporated. Fluff quinoa with a fork and let stand for another 15 minutes. In a large bowl, combine quinoa, onion, celery, carrots, pine nuts, garlic, parsley, red pepper flakes, coriander, cheese, panko bread crumbs. Add the beaten eggs and splash of water and mix. The mixture will be a bit wet and sticky– you should be able to form patties easily, about 1/2 inch thick. If it’s too wet, add some more breadcrumbs. If it’s too dry, add a bit more water. Heat 2 tablespoons of olive oil in a large skillet. Place patties with a bit of room between each and cook until deeply browned, about 4-6 minutes per side. Remove from skillet and place on paper towel. Alternatively, these patties can be baked! Preheat the oven to 400F. Use non-stick spray or parchment paper on a baking sheet. Place patties on baking sheet and bake for about 20 minutes. Flip and bake for another 5 minutes. Serve over bed of lettuce with half a lemon. Serve plain with sides of tzatziki and hummus. Place between seven grain bread with lettuce, tomato, avocado, and onion. The possibilities are endless. Have fun :). Are you ready to salivate? WOW! Sounds delicious….How about serving these as appetizers and bake them in mini muffin tins…Would the hold together? I may try them with quinoa, zucchini, parmesan and top with a bit of smoked salmon…how about that? Thanks Kels!